Simpson Lake East Conservancy protects a small portion of land, water and forest at the eastern end of remote Simpson Lake, in the Hecate Lowlands Ecosection. Access into this wilderness area is difficult because there are no roads, trails, or marine boat access. 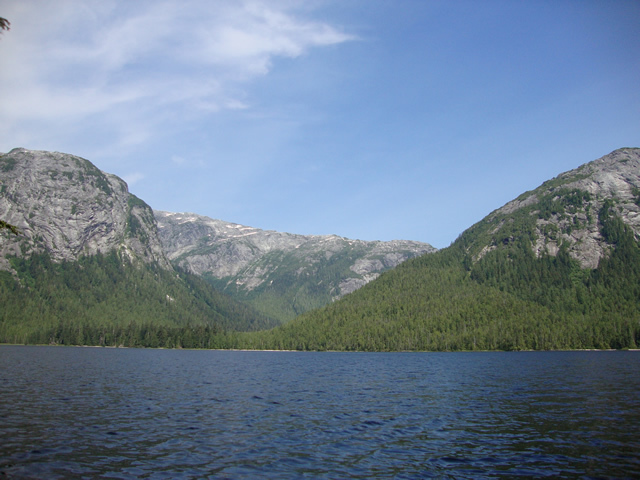 Simpson Lake East Conservancy is only accessible by float plane or helicopter and is located approximately 28 km NW of Hartley Bay and 74 km SW of Kitimat. It is located about 13 km NE of Grenville Channel, about 2/3 way down the Channel. It is also located between (but not adjoining) Alty Conservancy to the north and K’mooda/Lowe-Gamble Conservancy to the south. History: Simpson Lake East Conservancy was designated as a conservancy on May 31, 2007 following recommendations from the North Coast Land and Resource Management Plan. Cultural Heritage: The conservancy is in the asserted traditional territories of the Gitga’at and Gitxaala First Nations. There are no known archaeological sites in the conservancy. Use the below links for more information or to contact these First Nations. Conservation: The conservancy protects the undisturbed old-growth forests, fish and wildlife habitat at the eastern end of Simpson Lake. Wildlife: Waterfowl, bears, wolves, otters, eagles and furbearers may be seen in the conservancy. Adventurous and experienced canoeists or kayakers may enjoy exploring Simpson Lake if they can get their boats to the lake. There are opportunities for trout and char fishing in Simpson Lake. Please consult the appropriate non-tidal fishing regulations for more information. Anyone fishing or angling in British Columbia must have an appropriate license. Swimming is possible in the lake, but the water is cold all year-round. There are no lifeguards on duty in the conservancy. Waterfowl, bears, wolves, otters, eagles and furbearers may be seen in the conservancy.